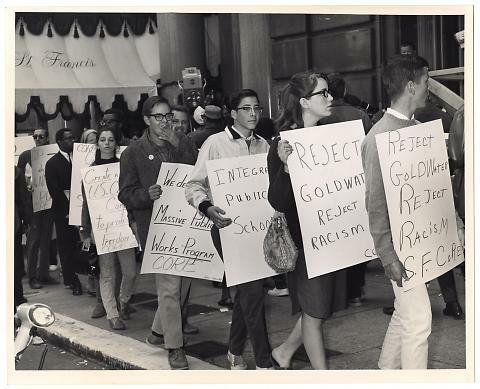 From back of photograph: "Core picket - St. Francis" A line of protestors pickets outside of the St. Francis Hotel in San Francisco during the presidential campaign of Barry Goldwater. The protestors are supporters of CORE, the congress for racial equality. They carry signs with anti-racism and anti-Goldwater slogans like "Reject Goldwater Reject Racism S.F.CORE" and "Integrate Public Schools." Both African American and Caucasion protestors are visible. Many appear to be around the age of college students. The hotel itself is in the background, with an overhang reading "St. Francis." There is also at least one camera recording the event.